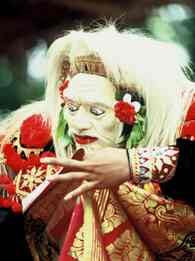 Balinese culture, dance and drama. ‘Topeng’ means mask and the mask dance relates the tales of Balinese and Javanese ancestors returning temporarily to inhabit the mask. Nowadays, the main stories with their princes and clowns are preceded by set of solo mask dances of the ‘strong warrior’, the ‘topeng tua’ – a fantastic dance showing the advance of old age in the king’s old counselor, and the ‘topeng dalem’ – showing the king in all his glory with enough clowns to fill a circus.